YOUNG, Milton Ruben, a Senator from North Dakota; born in Berlin, La Moure County, N.Dak., on December 6, 1897; attended the public schools of La Moure County; attended the North Dakota State Agricultural College at Fargo, and Graceland College in Lamoni, Iowa; engaged in agricultural pursuits near Berlin, N.Dak. 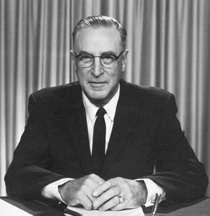 ; elected to the North Dakota house of representatives in 1932; member, North Dakota senate 1934-1945; appointed on March 12, 1945, to the United States Senate to fill the vacancy caused by the death of John Moses; subsequently elected as a Republican to the United States Senate, by special election, on June 25, 1946, to complete the six-year term ending January 3, 1951; reelected in 1950, 1956, 1962, 1968 and 1974 and served from March 12, 1945, to January 3, 1981; was not a candidate for renomination in 1980; served as President pro tempore of the Senate during the Ninety-sixth Congress; resided in Sun City, Ariz., until his death on May 31, 1983; interment at Berlin Cemetery, Berlin, N.Dak. Collin, Andrea Winkjer, and Richard E. Collin. Mr. Wheat: A Biography of U.S. Senator Milton R. Young. Bismarck, ND: Smoky Water Press, 2010; American National Biography.